Argos CDAB8R review | What Hi-Fi? 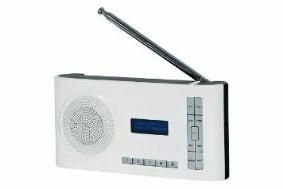 It's easy to assume that the ever-decreasing price of DAB radios can only be a good thing. Judging by the quality of this Argos own-brand set, there can certainly be a downside. Having said that, this is far from ugly and feels reasonably well made, and with its slim dimensions is eminently portable. There's a headphone socket (built into the back of the unit), and ten user presets each for DAB and FM. The problem is the sound. Tune in to talkSPORT on DAB, and the delivery is thin and weedy enough to rob the presenters' voices of their natural tone. This is exacerbated when listening to music, and Radio 1's pop playlist lacks any weight or detail, and distorts badly when the volume's raised anywhere above very quiet. It's cheap, but we'd rather spend a little more on something decent.